Since the release of Docker Swarm at Artica TS we’ve been planning a way for Pandora FMS to combine with this new Docker feature, in order to monitor complex Docker Swarm environments under high availability schemes. 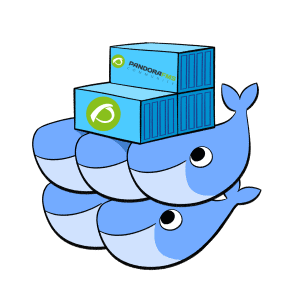 As we mentioned in a previous post, Docker Swarm is a new feature built by Docker Inc. and that is essentially a native clustering mechanism that’ll turn a pool of Docker hosts into a single virtual host. This means that you’ll be able to use Docker predefined backends, or switch them to your own, and scale your Docker nodes as needed to deploy containers on your network, no matter the size or how many devices are registered under it. The way Pandora FMS synchronizes with this is through a group of Docker containers which together provide automatic monitoring under a wide array of situations: high loads, device or component failure, etc. This implies that you’ll be able to control the entire structure built around Docker Swarm and know how your container distribution is working, even if it’s already been simplified into clusters. This has the purpose of making the scaling process in complex environments have even larger possibilities, as well as being simpler to manage and control; step by step. The plugin revolves around a dockerized version of Pandora FMS which will do the monitoring, and also maintains the capacity to be easily deployed on your network along with Docker itself. This is so that Pandora FMS can run and monitor Docker Swarm on as many devices as necessary, whilst maintaining the Docker container scheme. It’s quite self explanatory and, once you test it on your Docker Swarm environment, you’ll see how something which has already been made simple can actually be automated, resulting in you taking more advantage of your time on those things that really demand your undivided attention. As always, Pandora FMS works to make our everyday monitoring tasks as simple as can be, leaving you more room to actually worry about the content you’re deploying rather than how it’s deployed efficiently. Below you’ll find a short explanatory video on how the plugin works, because the simplicity of an image sums up any amount of words we can write. We do hope this plugin results as useful for you, the users, as we have thought it to be. If you have any suggestions, or think of any tweaks and performance boosters that could be applied to improve this plugin, make sure to let us know!